In an age of widespread political dissatisfaction and frustration, including within parties, Mitch McConnell has pulled off quite a feat. No, it's not the least bit surprising that he's been unanimously re-elected as majority leader by his conference; there was zero expectation of any other outcome. Indeed, no one even hinted at mounting a challenge to McConnell. In some ways, that's the achievement. His leadership has rallied his disparate caucus around him, winning admirers (both enthusiastic and grudging) from across Senate Republicans' ideological spectrum -- ranging from moderates like Susan Collins and Lisa Murkowski to center-right conservatives, to the party's right flank. 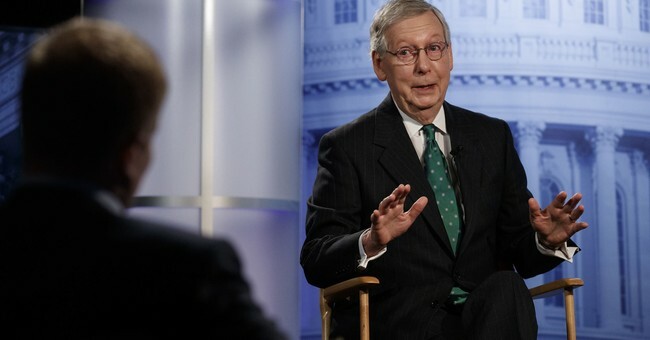 And not terribly far removed from being a deeply unpopular figure among his party's base, McConnell has seen his stoke rise with many core GOP voters. How? One word: Judges. Looking ahead to the coming year, there will be no shortage of opportunities to continue this impressive record of cooperation across the aisle and across the Capitol. What we can make of those opportunities will depend on our Democratic colleagues. Will they choose to go it alone and simply make political points? Or will they choose to work together and actually make a difference? ...The American people made it abundantly clear that they prefer that Congress focus on making a difference. That message may have been lost on a few House Democrats, who have made clear their preference for investigations over policy results. After years of rhetoric, it’s hardly news that some are more interested in fanning the flames of division than reaching across the aisle. But however Democrats interpret the latest message from voters, Senate Republicans will continue our commitment to delivering results. We’ll keep working to lift the burden on American job creators and small businesses. We’ll stay focused on helping communities across the country seize new opportunities and realize greater prosperity. We’ll seek new ways to make life easier for working families. Most importantly, in the face of whichever tactics the far left chooses to employ next, we’ll continue to stand for the rule of law. We’ll continue to confirm more well-qualified nominees to serve on our nation’s courts. This is what the Senate’s Republican majority was elected to do. And we’ll continue to get it done. Q: So you’re a no on floor? Democrats had a good November, but they've got internal trouble ahead, too. By the way, if you don't get the "cocaine" reference, just read this.